In this day and age thieves are becoming more and more sophisticated with their stealing techniques. As a result car security manufacturers need to stay ahead of the game with more sophisticated technology. We are in a technology era and as the progression of convenience-based app design and industrial science evolves so does our expectations of what we expect out of our technology-based purchases. Living in much earlier years the concept that someone could lock their front door by tapping a little handheld computer against it or adjusting the thermostat at home from locations miles away would have been looked at as though it was witchcraft. Now, however, it is easy to imagine. We tap our phones to pay for our groceries, we walk up to our car and it automatically unlocks, we can now even look at our phones and they unlock via face recognition. This is all something from science fiction movies but we are fortunate enough to live in this new era. This is the era we live in, the technology era and we expect that our security can do just as much. Car theft is extremely common, especially in urban environments. Vehicles are big ticket items and unlike a home (a very big ticket item) vehicles are much easier to physically move. There are a whopping 146,000 car thefts per year in Canada and in the United States, there are 237 reports of car theft per 100,000 people. It is easy enough to see that car theft is very common. It can, however, be prevented. We have articles written about simple adjustments to your routine in order to avoid car theft and this article will go through the best after-market car alarms currently on the market. We have gone through reviews from consumers that have purchased these alarms already. We have compiled the top rated of these car alarms and have found both the pros and the cons of each. Additionally, we have found the three that we considered to be the top product, the Editors Choice, and the Best Value. Let’s get into it; here are the top rated car alarms for 2018. This security system is has a three channel one way fob system. It has keyless entry, engine starter kill, and a panic alarm. It also utilizes the parking lights as a form of warning signals. This system is fairly inexpensive and highly rated; this is why it is the Editors Choice. The antenna has a flashing blue LED light to let thieves know that the vehicle is equipped with a security system hopefully deterring them from touching the vehicle at all. This means you can shut down the system so that the alarm and remote starter are shut down but the vehicle can still be accessed via keyless entry if required. This unit is fairly inexpensive. 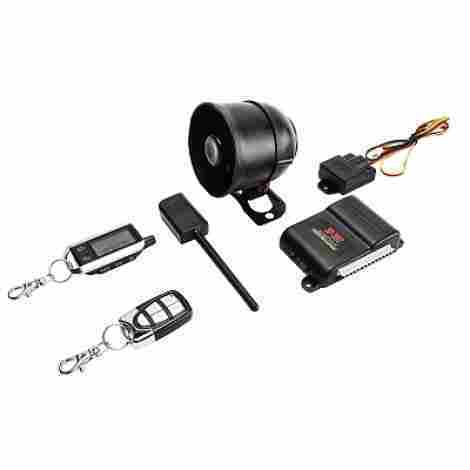 It has all the features needed for a security system like a siren, wiring to lights and shock sensors plus it has additional features like keyless entry, the blue LED light and a soft chirp. Because of all the additional features, this security system is definitely worth the price and good for people on a budget. This security system is one of our top 3 recommended products. It is highly rated by consumers due to its reliability and durability. It also has remote vehicle starting abilities and comes with 2 responders. It has a range of up to 1 mile. This security system comes with two remotes, one of which has a small HD colour screen. This function is something included on Lamborghini remotes and is a super slick feature. 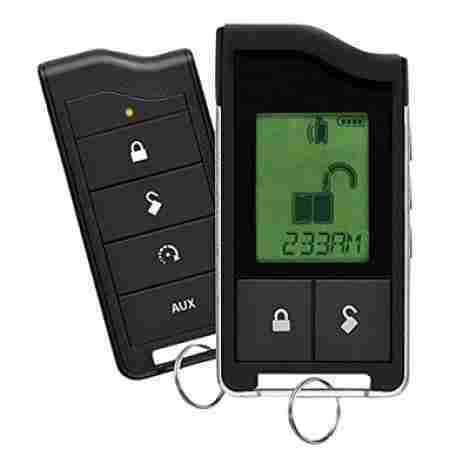 The remote on this security system has a range of up to 1 mile which is an improvement from the older models. It is also has one of the longest ranges of receivers currently on the market. This security system is higher in price. Viper is a reputable company and their products are known for being reliable and long-lasting. This product is highly reviewed making the peace of mind you will have the justification for the price of this product. This system is our Best Value recommendation for security systems. It is loaded with features and has a very nice price tag. It includes the basic security system with wiring for parking lights. It also has a two-tone siren in addition to panic mode and chirp mode. It also includes sensors. This one is recommended for people on a budget. 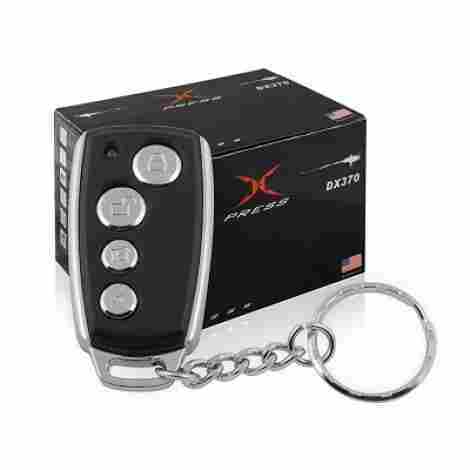 It includes 2 remotes, ignition locks, and an LED light indicator as well. It is loaded with features and is great for individuals on a budget. In addition to the low price tag, it also includes a limited lifetime warranty. As stated a couple of times now, this unit is quite inexpensive. It comes with all the features you need plus some and it is definitely very affordable. This is our top pick for those on a budget. 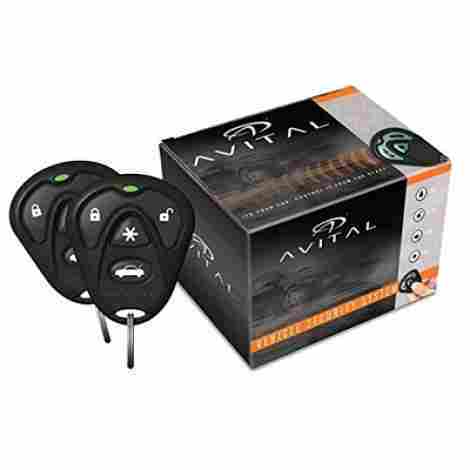 This security system includes a remote keyless entry, an automatic vehicle starter, and stopper. It has a universal fit and includes 22 other helpful features. The list is too long to go into here but this system has new and interesting features like touch password entry, automatic window closing and power off options. It definitely has a low level of buyers remorse. This system will work on almost all vehicles. This unit is a little higher in price due to all of its optional functions. With vehicle location finding and remote trunk release this security system is the creme de la creme of security systems. This security system is a little bit more basic. It includes two one-way remotes and both sensor and siren technology. It is diesel engine safe and has a range of up to 1000 meters. 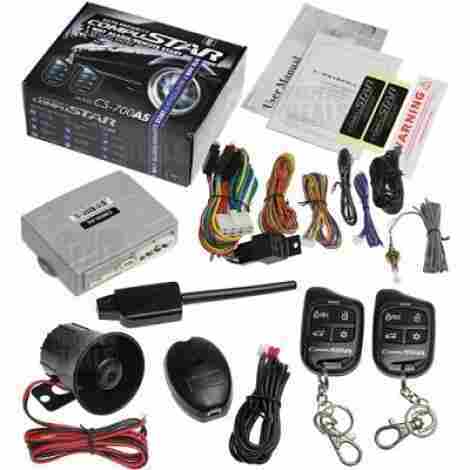 This security system has all the basic additional features including remote start, impact sensor, keyless entry and a loud siren. Unlike the Easyguard security system, this system is a lot easier to install saving the cost of hiring a professional. This product is mid-range in price. The justification for the price is that it does include all the base add-ons including an automatic vehicle starter and keyless entry. In addition to those features, this system should be able to install at home so you skip the cost of hiring a professional too. This security system is the least expensive of all the security systems in this article. It comes with a couple neat features and a one-year warranty. It is easy to install and easier on the bank account. Even though this is extremely low in cost it still has the additional shock sensors, vehicle location finder, trunk release and automatic locks. There is also no additional cost associated with stalling this system making it even easier on the wallet. If you have not gotten it yet, this unit is very inexpensive. XO vision is a reputable company and has produced a product that anyone could afford and probably install themselves, this is an awesome bang for your buck! This security system has real-time alarm status and triggers. It includes two remotes, a 20 watt single-tone siren and shock sensors. It also includes a silent arm and disarm function, keyless entry and trunk open options. This unit will page you to give you updates on what is happening to your vehicle. It also includes two remotes, one of which has an LCD screen with graphics. 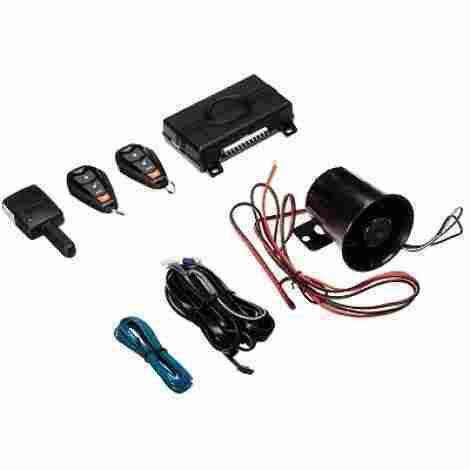 This system includes keyless entry, truck open, sensors, dome light sercurity and about 10 other add-ons. This security system is somewhere in the middle of low and mid-range in price. Considering all the additional features this should be about mid-range so it really is a good deal. This security system offers tones, text, vibration and a display. It also has a remote start option and can work up to 1 mile away. The responder is also a two-way responder making it super convenient. These remotes are not just sleek looking but they are also extremely durable for those who may be a little rough of their keys. The included sensory system has several different adjustments available including general sensitivity as well as options for tilt and proximity. For vehicle owners that often park in areas that are a little loud or shaky (like airports or construction sites) and find their unit goes off relatively easily to these types of impacts, this product may be for you. This security system is mid-range in price. It has the basic add-on's that the majority of the systems comparable have on the market but it also has the customizable features as well as a vibrating remote. The durability of the product as well means you won't need to replace either the unit or the remotes anytime soon. This is the justification for the price. This security system is pretty inexpensive in price. It includes dome light supervision (the dome light will flash on and off when the system is engaged) and keyless entry. The remotes are small and compact and the whole system runs on three different channels. This security system has keyless entry, remote start, and siren security. It also comes with two fobs and is easy to install. Considering the price, and considering other units with similar functions, this security system is quite inexpensive. This security system utilizes the lights of the vehicle when responding to commands. The parking lights will go off when the vehicle is locked and unlocked, and the dome light flashes when the alarm is going off. This security system is definitely on the lower end in price. It has everything you need for a basic security system plus additional features like keyless entry and automatic start. Due to these features, the unit is definitely worth the price. 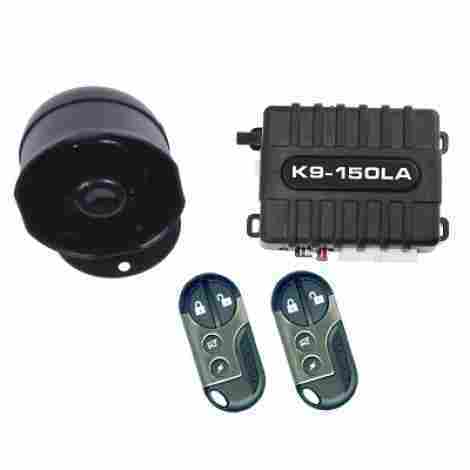 This security system uses both a siren and the horn at the same time to draw attention to the potentially stolen vehicle. It comes with two fobs and a keyless entry feature. It offers a 1 year parts and labor warranty but the brain has a lifetime warranty. This unit will send out warning chirps before the alarm goes off to give the thief a chance to back away hopefully without really touching the vehicle. This product is fairly inexpensive. Considering its features and warranty it is great for people on a budget. That is our list of top 10 car security systems and our top 3 of those top 10. Having a reliable security system is incredibly important especially now. Items to consider when deciding whether a security system is worth it outside of the obvious cost to replace your vehicle are whether your insurance company covers theft and whether the vehicle you are driving is on the list of top stolen vehicles. Currently, the top stolen vehicles are Honda Civics, Cadillac Escalades, Acura Type S and Integra, Audi Quattro and Hummer H2s. Another perk of having a security system installed is often a decrease in premiums for your insurance as well as the increased resale value of the vehicle. The most effective reason for purchasing one is not only avoiding the shock of having your personal property stolen but also the pain aching process of dealing with insurance companies and getting the vehicle replaced. The time between the assessment, the confirmation that the vehicle was actually stolen and cutting a new check can be months which can affect your daily activities but also cost associated with new forms of transportation. Having an automotive security system solves many issues but most of all, it stops thieves from profiting off of your loss. We hope this list was informative for you and helped you find the best product for your need. The first thing to consider when looking at security systems is the features of it. You need to consider what specifically you are looking for in a security system. Not everyone wants or needs the same features and additional features usually mean additional cost. The best way to find a security system that is best for you at the best price is to buy the security system with the closest features to what you want without buying too many additional that you won’t need. 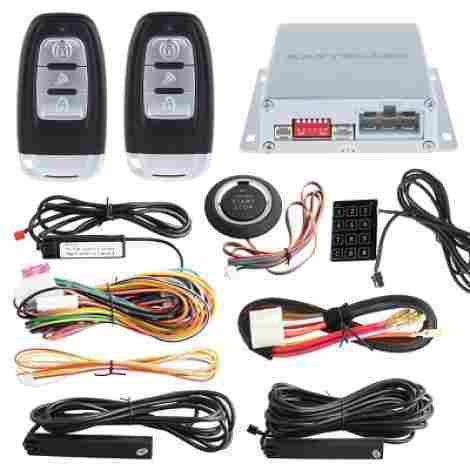 Features in security system are things like keyless entry, engine immobilizer, sensors and remote start. Keyless entry is exactly what it sounds like, it opens your doors with a button rather than a key. This will only work with electronic locks (not manual ones). The engine immobilizer feature is something that will stop the engine of the vehicle if the alarm is going off while the individual behind the wheel is attempting to move the vehicle. When this happens the engine won’t be able to start again until the alarm has been effectively disabled (which can only be done by the individual holding the remote to do so). Sensors are units that are installed throughout the car in order to detect movement. This will happen when the vehicle is either being prepped to be towed or if someone is attempting to jack your vehicle (typically done to access tires). This is handy in areas where vehicle part theft is common. This also may be handy for if the vehicle is left in a tow-away zone. The vehicle owner can at least get to the vehicle and speak with the tow truck driver. 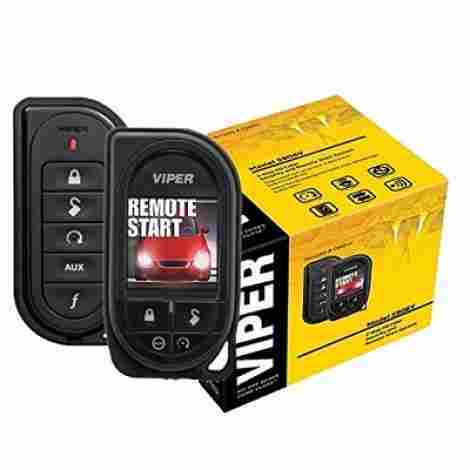 Remote start will start your vehicle via remote from a certain distance. This feature is handy on cold or hot days to get your vehicle warmed up or cooled down before getting into it. Consider the features that you need in an alarm before purchasing it will save you money and time (installing these additional features will take more time or may require a professional at an extra cost). It is easy to be scammed on the internet especially when you don’t have experience with security systems. The cost of security systems range anywhere from $30.00 to $1000.00. It is important to know what a reasonable cost for the additional features are in order to decide whether the cost is worth the product. The cost is usually associated with the quality of materials, the reliability of the product (and company), and its additional features. As mentioned above, make sure that the features you are paying for are features you need and will use. Otherwise, it will end up being a waste of additional money. Cost is also associated with the installation. Some individuals are automotive savvy but for those who are not a professional may be needed and that will also cost money. On the other end of cost, the proper installation of a security system and its features can be a positive thing. Insurance carries will sometimes give a rebate or lower cost of insurance back if some sort of security system is installed in the vehicle due to the lower risk of theft. Additionally, having a security system installed may increase the resale value of the vehicle when you eventually sell it. Remember you get what you pay for. If features are the primary focus when it comes to cost then that is okay however if the buyer is willing to accept a less experienced and unreliable company, or if they are willing to accept lower quality products for lower cost then it isn’t the best way to purchase a good product. At the end of the day losing the car is going to cost a lot more than buying a quality security system and this should be always considered when shopping around. The value of the security system is both the features (that was discussed above) and the materials the security system is made of. You want to make sure that the product you are using does the job it is supposed to do. For instance, for sensors, if they are not very sensitive then they will not set the unit off very easily. On the other side, if they are too sensitive then it will set the unit off when it isn’t supposed to. The value and functionality will ultimately tell the buyer if the unit will be effective or if it will drive you nuts with unnecessary triggers. The materials themselves should be quality. The remote should be made of a material that won’t easily break and glue that won’t fall apart. Keys are usually tossed so you don’t want the remote to fall apart easily. The unit installed should be small enough that it isn’t seen and should have glue that will stick well for a long period of time after installed. The unit itself shouldn’t drain your battery either. There’s nothing worse than coming back to your vehicle and not being able to start it due to a dead battery, though we guess this also would be effective in avoiding car theft. The reputation of a company is very important. First of all, we want to make sure that the company is not on the verge of bankruptcy. This will make it pretty hard to return your product especially if you bought it directly from the manufacturer. You also want to make sure you are buying the product from a company with a good reputation for producing quality products. A company should be known for their quality products, their stability and their experience in the industry. Experience will go a long way in regards to the type of product that the company is producing. When a company has long-term experience you know they have been around long enough to go through the trails and errors of their product and that they are producing a product good enough to stay in business. The location of the manufacturer is also important because you want to make sure that they have done the research and had the experience of having a vehicle in your current environment. You also want to make sure that the company has access to quality materials to build the products they are selling. Location will also help with shipping costs to the buyer and back to the manufacturer in the case of returns. Installation is important to consider because this will either dictate the time associated with installing a product or the cost associated with installing it. Does it require additional tools not included in the purchase? Is it easy to install or is it pretty sophisticated? Does it require electrical work? Will a professional be needed? All these questions will help you find out if there will be additional cost and/or help when installing your security system. Additionally, where will the physical alarm be installed? Will it be hidden? Will it be exposed? Will it look ok? Or will it wreck the aesthetic of the car? Also, can it hurt the car? Will it drain your battery or wreck the electrical system in the car? It’s important to do the research on this as well as to ensure that your vehicle can handle the electrical needs of the car before purchasing your car alarm system. Q: What is a security system/how does a security system work? A security system works in a couple ways. Some work when the glass of the vehicle breaks, some go off when someone attempts to hot-wire the vehicle, some have sensors that go off when the vehicle is moved too aggressively (like being jacked or towed). It all depends on what the features are on the system you purchase. Some systems will connect to your horn and will set the horn off when the unit goes off and others include an additional siren. To be very basic in explanation a security system is that it connects via spliced wires to different internal areas of the vehicle electronically in order to utilize its current electrical system for the purpose of using it for security purposes. For example the security system will use the horn to honk repeatedly if the unit is triggered or it will use the parking lights to flash repeatedly. Again, it depends on the system that is purchased. Q: How do you install a security system? There are instructions included in the packaging and online on how to install your particular model. It is wise to consult those first. It also may be required that you go see a professional before installing your unit. It really depends on the amount of spliced wires that are required and your knowledge of automotive electrical systems. You can also call the manufacturer for advice if required. Q: What causes a security system to go off? Several factors, depending on the type of unit you have and its features. Alarms can go off when windows are broken, when the vehicle moves abnormally or when someone attempts to hot-wire it. It is important that you read the specifications of the security system you are buying so that you know exactly what features it has. Q: What is a security system immobilizer? This will actually immobilize your engine, preventing the culprit from starting your vehicle without you being there to disable it. This is a very handy feature for when thieves are not scared off by honking, sirens and flashing lights. Q: What is a security system valet switch? The valet switch allows the vehicle owner to turn off the security system without disabling the keyless entry for times when it needs to be disabled. Q: How do you stop the security system once it has gone off? You would be able to do this with the fob unit included with the package. Q: Will a security system go off if someone breaks a window? Not always, it depends on the unit you have. This typically requires sensors. Q: Will an aftermarket security system void the warranty on my vehicle? No, legally it cannot. There was a law passed that actually stopped manufacturers of vehicles from being able to do this. Rest assured, your warranty is fine. Q: What are relays? Are they usually included in the system? No, they typically are not. Relays are like switches that help power specific areas of your vehicle. Without them you may have issues with the functions of the security system. The packaging will tell you if you need to purchase specific relays in order to utilize the systems specific functions. Q: Will a security system kill my battery? It shouldn’t. A good quality security system should never kill the battery in your vehicle. Check reviews on products you are buying to ensure that no one reported this as an ongoing issue.